DR. SACHER'S HERBAL OIL 111. Made in GERMANY 100ml. Swedish Bitters Herbal Company › Herbal Oils › Dr. Sacher’s Herbal oil 111 – Made in GERMANY 100ml. Pure blend of essential oils!!! Dr. Sacher’s herbal oil according to the recipe No. 111 is a combination of numerous essential oils from countries all over the world. For several centuries people have been using the positive properties of essential oils from medicinal herb extracts. Only a few drops are needed to unfold their strength and effectiveness in many areas. As a result, Dr. Sacher’s herbal oil No. 111 is concentrated and only small amounts are needed when massaging, gargling or when rubbing into the skin. It can also be used to improve the air and to distribute a pleasant, refreshing fragrance through dispersion or vaporization and only a few drops are needed. Especially in our modern times, people are returning to the powers provided to us by nature. Because Dr.Sacher’s Oil 111 is very thin, and once applied on the body will penetrate fairly quick. To use it for regular massage it is recommended to mix few drops of Dr. Sacher’s oil with regular massage oil, and massage your whole body. 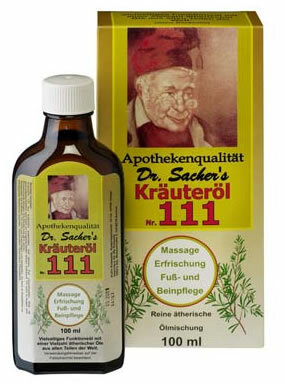 To feel refreshed, or if feeling fatigue, rub your forehead with few drops of Dr. Sacher’s Oil 111. To eliminate foot odor, mix few drops of oil 111 in a tub, or rub your legs and feet with the oil 111. If you are heaving unpleasant breath, mix few drops of oil 111 with water, and rinse you mouth. DO NOT SWALLOW. When having muscle pain, or any muscle inflammation, rub effected area with oil 111 for few minutes or until oil penetrates and in few minutes pain will decrease. WARNING! Keep out of the reach of children. Absolutely DO NOT swallow, swallowing oil can lead to serious health problems and lung damage. Oil must not come into contact with the eyes. Not suitable for children under 6 years of age. Keep away from fire. Just wanted to drop a note saying that I’ve been using oil 111 by Dr. Sacher’s for couple of years now. Although it does not treat the issue I have with my spine, it does help alot with the muscle pain and works great as a temporary natural pain relief. I also tend to sleep better after using this oil…. not sure of the effect it has on my sleep but I think it calms me down. Great product. I started using this oil for about a year now. I’m extremely satisfied customer. Because i have a sitting job i have severe muscle tightening in my neck, shoulders, and back pain. I ask my hubby to massage/apply it on me before bed, and it relieves the pain tremendously. I sleep like a baby at night after its use. I use it practically for anything/everything. My daughter (8 y.o.) complains of leg pains and i used to use vick rubs and would need to get up multiple times at night to reapply it for her. but after i got this oil, it truly works wonders, and she doesn’t ask for it to be reapplied. I really love it, and it smells AMAZING, i think even the smell itself allows you to relax and helps calm your nerves, de-stress after a hard day. I’ve hit jack pot. It would be too greedy of me not to share my story. It was discontinued. We are looking for a new supplier. Jag har haft en systa uppe på tumleden och har nu använd oljan så gott som varje dag och nu är den helt borta, helt otroligt för den såg ut som ett ben från tummen som stack ut, den var hård och större än en ärta. I’ve had a sore up on the tummy and have now used the oil virtually every day and now it’s completely gone, incredible because it looked like a bone from the thumb stuck out, it was hard and bigger than an pea.